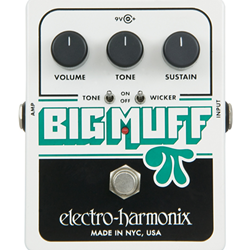 Like the legendary Big Muff Pi of the '70s, the USA Big Muff Pi Pedal reissue has 3 controls that let you dial in the finest harmonic distortion/sustain ever produced. The Volume control adjusts the output level. The Sustain control optimizes the long sustain with just the right amount of harmonic distortion. The Tone control provides a range of sounds from warm bass to crisp treble.